"You know what would make me feel really safe right now? If you got hit by a truck and died." Kevin Costner has a penchant for giving a handful of amazing, Oscar-worthy performances, then following them up with beyond mediocre work in putrid films. His latest, Mr. Brooks, falls among the good Costner performances, a surprise given the premise, and, more strikingly, the choice of supporting cast members. Earl Brooks (Kevin Costner) is a rich family man who has one major vice: he's addicted to killing people. After being honored as the "Man of the Year" by the Portland Chamber of Commerce, Earl celebrates by making his first killing in two years. He's never alone in his evil ways, though, as the imaginary Marshall (William Hurt) is never far away from the murder scene. Enter Detective Tracy Atwood (Demi Moore), who's been trailing Earl, AKA the Thumbprint Killer, for years; she's hot on his tail. Earl is also joined by a real companion, the so-called Mr. Smith (Dane Cook), who photographed Earl's latest work and wants to help him kill. Add the return of Earl's daughter, Jane (Danielle Panabaker), to the household, and this confused killer just might be on a path to redemption. It doesn't take long for us to find out that our protagonist isn't exactly the sanest guy in the world. It's a mere five minutes before we get our first appearance from Marshall, but his presence grows tiresome by the third visit. While Hurt does a nice job as Earl's "devil on the shoulder," these sequences are far too distracting. They also don't make much sense, as Earl and Marshall carry on full, five-minute conversations, while the rest of time seemingly stands still. The film features the schlockiest bit of casting in quite some time. Costner is in rare form as Earl Brooks, giving us a realistic portrait of a strict family man who is addicted to killing people. He does an amazing job avoiding being overly hammy in a role that teeters on campiness around every turn. The real revelation, and it pains me to say this, is Dane Cook. Perhaps he's a good actor that should stay away from his unfunny comedy routine, but regardless, he's very strong here. Even Demi Moore is sharp, playing drama for the first time in many years. Overall, this is a clever casting job that could have been one of the biggest mistakes in recent film. Things are far from perfect, but this is an entertaining little thriller. We get a few too many musical montages for my blood, and when Costner dons a wig, fake mustache, and beard, all we can do is laugh in disbelief. Plus, it seems at first that the director wants to have it all. He depicts Earl as a psychopath who still has the presence of mind and heart to deeply love his family. Fortunately, the focus tightens up, and a funny thing happens near the half-way mark, as we're introduced to an entirely new dynamic that shockingly elevates the film to another level. This leads to a final sequence that is startling and a huge surprise, but, you know what, it works perfectly. The absolute final shot might seem like a cop-out, but in retrospect, it stays true to the rest of the proceedings, and brings things home nicely. Image Transfer Review: Presented here in 1.85:1 anamorphic widescreen, the picture is full of sharp, detailed images. We also see rich blacks, well-handled shadow and contrast levels, and a rich color palette that never suffers from any bleeding or other blemishes. Dirt, grain, and other print flaws are fortunately kept to a minimum. Audio Transfer Review: We actually get a couple of audio choices. The Dolby Digital 5.1 mix features liberal use of the surrounds and wonderful directional effects. An accompanying DTS track has all of that and then some. This mix bests the other thanks to much deeper, more aggressive bass, and simply louder sound effects during the action-oriented sequences, namely those involving gun shots. Dialogue is nicely-delivered on both tracks, remaining crisp and clean throughout. 1 Feature/Episode commentary by Bruce A. Evans and Raynold Gideon. Extras Review: The nice extras collection starts off with an audio commentary track by Bruce A. Evans and Raynold Gideon. They talk with great pride about their film, and rightfully so, but they allow for plenty of time to give informative and entertaining details about its production. There are six deleted scenes that run just over six minutes, and include a very cool alternate opening title sequence. 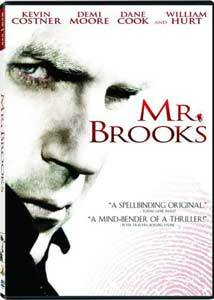 The Birth of a Serial Killer: The Writing of Mr. Brooks is a seven-minute piece that is highlighted by interview footage with Evans, Gideon, and Kevin Costner. On the Set of Mr. Brooks runs for nine and a half minutes, and is a basic EPK, complete with on-set, interview, and final release footage. Murder on Their Minds: Mr. Brooks, Marshall and Mr. Smith is another featurette that runs just over nine minutes. This is an actor-centric piece that includes discussions with Costner, William Hurt, and Dane Cook. We also get the original theatrical trailer for Mr. Brooks, as well as additional previews. After expecting the worst, the Kevin Costner vehicle Mr. Brooks turns out to be a tight, compelling suspense thriller. Costner is at the top of his game, and, with the help of risky, yet inspired casting, the film is a complete, chilling character study. MGM's disc is also nice, mixing great audio and video presentations with interesting extras.